Welcome to the April Newseltter. The Amitabha Practice day scheduled for Sunday 5th June has been moved to Saturday 11th June as the Sangha will be attending the Karmapa's teachings in Paris. We have added an extra day, Sat 30 April which, with the already scheduled Sun 1st May, will make it a full weekend of Amitabha Practice. For all the Amitabha Practice days, you are welcome to attend as many (or few) of the sessions as is possible. Tibetan Language class - a new 8-week class will start on Friday 15 April with Tenzin Samten. Suitable for those with some familiarity of the tibetan alphabet. Please book in advance through the office. Raffle tickets in support of the Circle of Nourishment are now for sale from the office. 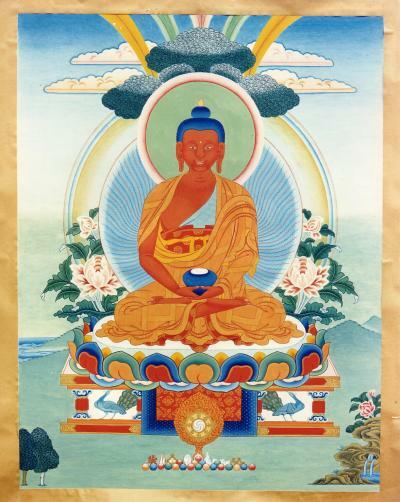 1st Prize is a large, beautiful thangka of Shakyamuni Buddha, printed and framed in brocade. Tickets are £2 each. The winning tickets will be drawn by Choje Lama Yeshe Losal Rinpoche during the Courtyard Fundraising Party on Friday 26th June (see below for more details). The Importance of Refuge and Instructions on Prostrations - Saturday 9th April, 10.00 - 4.00 pm. Lama Zangmo will cover these two essential preliminaries in this day of teaching. The Ngondro text is available in the shop. The Four Thoughts that Turn the Mind to the Dharma - four Thursday evenings (14th April - 6th May), 7.00 - 8.30 pm. Each session will include time for contemplation. The book "DHARMA KING - The Life of the 16th Gyalwang Karmapa in Images", containing 1,000 photos, is now available in the shop. Produced under the direct guidance of the 17th Gyalwang Karmapa, Ogyen Trinley Dorje, Dharma King: The Life of the 16th Gyalwang Karmapa in Images commemorates the 16th Gyalwang Karmapa's contribution to the practice and study of Buddhism around the world, as well as his preservation of the Karma Kagyu lineage. This seems to be a year for inspirational travel - Many of the KSDL residents and Sangha are currently in India attending Tai Situ Rinpoche's new series of Mahamudra instructions. Any news while they are there will be posted on our facebook page. 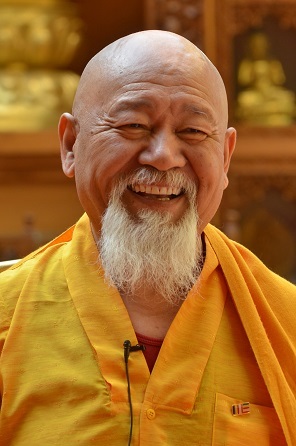 We are delighted to welcome Choje Lama Yeshe Losal Rinpoche, the Abbot of Kagyu Samye Ling Monastery, to Kagyu Samye Dzong London on Fri 24th, Sat 25th and Sun 26th June. The weekend will commence on the evening of Friday 24th June (arrive from 6.30 pm for a 7.00 pm start) with a fundraising party for the Circle of Nourishment - a social relief project in South Africa which supports vulnerable mothers and new-born babies through a weekly feeding scheme and donations of 'Stork Bundles'. This evening is a chance for you to spend informal time with Lama Yeshe Rinpoche as well as helping mothers and children in need. Of course, in order to have a skills auction, we need people to offer their skills in the first place. If you are London-based, or at least close, and can offer a skill that our audience can bid for (carpentry, washing dishes, hair-cuts, hovering, dog-walking, alternative treatments, whatever you think might be useful), please get in touch. What type of skill and how much time you want to offer is down to you. It is all for a worthy cause. The full programme for Joyful Living Through Meditation with Lama Yeshe (24th-25th June) is now available on the website. Due to the numbers of people expected to attend we would suggest that you book in advance. Donations for the weekend can be made using the PayPal button at the bottom of the event page. We are very pleased to be hosting a special screening of the film "Journey From Zanskar" at Kagyu Samye Dzong on Sunday 29th May, 4.30 - 6.30 pm. The director, Frederick Marx, will be here in person to exhibit the film and hold a Q&A, a great opportunity to learn more about the fascinating trials and tribulations of the several years it took to make the film. Zanskar is a precarious Tibetan border region in an extremely remote area of northern India, even more inaccessible than nearby Ladakh, described by the Dalai Lama as "vital to the survival of Tibetan Buddhism". The film poses the question: how far would you go to save a dying culture? On the instructions of the Dalai Lama, two monks from Zanskar's Stongde Monastery do everything in their power to insure the Buddhist roots of Zanskari culture are preserved through education. They embark on a journey to take 17 local children, aged 4 to 12, on a treacherous journey, over a 17,500 foot pass, to a school in the town of Manali. Journey From Zanskar - a screening with the Director is on Sunday 29th May, 4.30 - 6.30 pm. Cost: £10. You can book your place using the PayPal button at the bottom of the event page. Based on the principles of the book "Restoring The Balance" by Akong Rinpoche, this weekend course (23rd-24th April) is suitable for all those who seek a better quality of life. "Pain is inevitable, suffering is optional" Life is hard! On the outside we may seem very well but our inner life can be unnecessarily unhappy. We can restore balance to our inner life if we find out who we truly are capable of being. This down to earth weekend course includes a short exercise for finding out the difference between pain and suffering based on the Sallatha Sutra. There will also be a range of practices to help us accept painful circumstances with kindness and compassion, whilst challenging our habits of suffering unnecessarily. There will be walking meditations as well as exercises for developing gratitude and appreciation. The workshop will also look at impermanence and how to be flexible and adaptable, rather than rigid and easily upset by change. We can give ourselves time and space to meditate. Restoring the Balance with Clive Holmes takes place on the weekend of 23rd-24th April, 10.00 - 4.00 pm.You can book your place via the course page on the website. Donations can be made by clicking on the PayPal button at the bottom of the page. Living in large cities like London is an inherently stressful business. 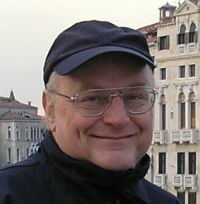 Human beings - like all animals - have bodily systems designed to respond to and process stress. But we're designed for short sharp bursts not the blanket stress of living in a crowded city. Mindfulness is a meditation practice with a 2,500 year pedigree and this weekend course introduces us to this incredible stress buster. Combining his experience as a long-term meditator and practising psychotherapist, Alistair works with the group to explore the causes of stress, how we perpetuate it and how we can release it and allow the body to down-regulate us back to a more vital state. Stress less! 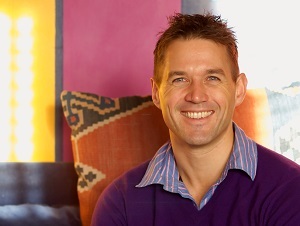 A mindful approach with Alistair Appleton takes place on the weekend of 14th-15th May, 9.00 - 5.00 pm. Book your place now via the Mindsprings website. Cost: £90 (£60 concessions). We can only guarantee admission to those with a confirmed booking. Refuge is the gate to Dharma practice. Prostrations are one of the four foundation practices that prepare body, speech and mind for the ultimate path of meditation, Mahamudra. Lama Zangmo will cover these two essential preliminaries in this day. A four week course with Lama Zangmo. Based on the principles of the book "Restoring The Balance" by Akong Rinpoche, this course is suitable for all those who seek a better quality of life. A weekend of Amitabha practice and mantra accumulation dedicated to the swift return of our precious Founder and Teacher, Chöje Akong Tulku Rinpoche. Offerings for the Shrine are welcome. This day marks the birth of Prince Siddharta Gautama in Lumbini, present-day Nepal. Join us in Samye Dzong London for an evening of auspicious prayers. After the prayers there will be some food and refreshments offered. Offerings of food to share are welcome. The day of Buddha's enlightenment is known as *Wesak* or *Saga Dawa Duchen* by Tibetan Buddhists. It is celebrated on the 15th day of Saga Dawa, the fourth month of the Tibetan lunar calendar and considered the holiest time of the year. Join us in Samye Dzong London for an evening of auspicious prayers. After the prayers there will be some food and refreshments offered. Offerings of food to share are welcome. A course exploring the Buddhist teachings on the impermanent and interconnected nature of all things.